The weather was perfect and the morning coffee was plentiful. I got to have lunch with my wife at an awesome Indian buffet, blasted through a killer six mile run, took my boy to boxing and helped my daughter with her homework. In the midst of all of this I was working an experiment that I knew in advance would be a failure; using my new Weber Jumbo Joe as a smoker. It turns out that my pre-conceived notions were flat out WRONG. 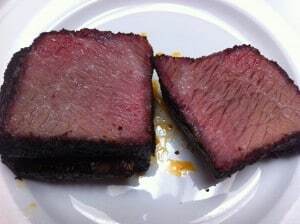 My test run using the Weber Jumbo Joe as a smoker was pure perfection. I could not have asked that little grill to do anything more. It sipped fuel and held temps steady in the 245-275F zone. I got my thin blue smoke and never had to adjust a single vent during a four hour cook. I could have turned this into a six hour cook without a problem. If I had been using lump instead of briquettes then I see no reason why 8-10 hours wouldn’t be realistic. I was working with about 3.5 lbs of beef short ribs. 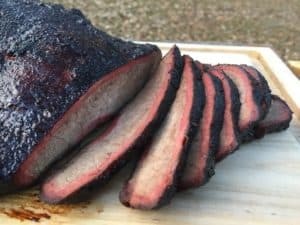 I hit the ribs with a rub pretty similar to the Paul Kirk brisket rub and let things work together in the fridge for an hour. I set up the Jumbo Joe with an 8 inch aluminum pan on one side of the charcoal grate and a bank of charcoal on the other. I added seven lit briquettes across the top of the charcoal pile with three pieces of hickory. 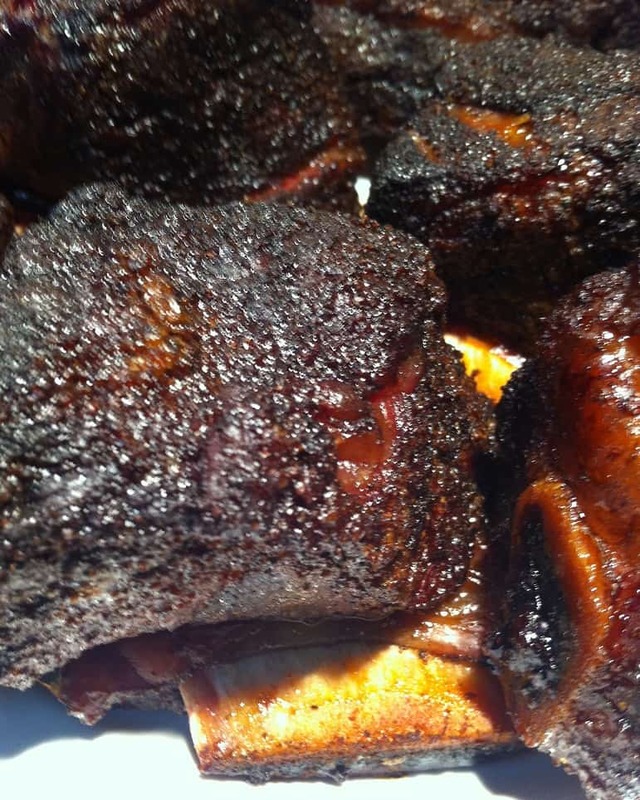 I poured a quart of hot water into the pan, placed the ribs on the grate and closed the lid. Both the bottom and top vent were halfway closed. I had the top vent above the ribs, opposite of the charcoal. I inserted a digital thermometer though the top air vent and monitored temperature at the top of the dome. Here is my cook log: Weather was 60F with light wind. 3:30 – 246F at dome. Took a quick peak and since I had it open added three unlit briquettes. 4:45 – 248F at dome. Added ten unlit briquettes. 7:00 – 276F at dome. 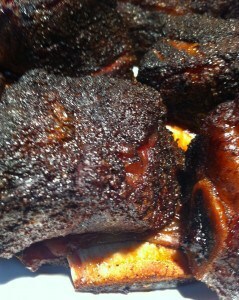 Ribs looked delicious and I took them off the pit. 7:30 – 275F at dome. 245F at the grate. I was just curious at this point; the ribs were in my belly. 8:00 – 267F at dome. I stirred the coals and restacked with tongs. 8:30 – 257F at dome. All ribs fully consumed. During the course of six hours I only had to add 13 briquettes. Going two hours between fuel additions is very feasible. Using this setup produced a 30 degree differential between the grate and the dome. I never had to adjust a vent. 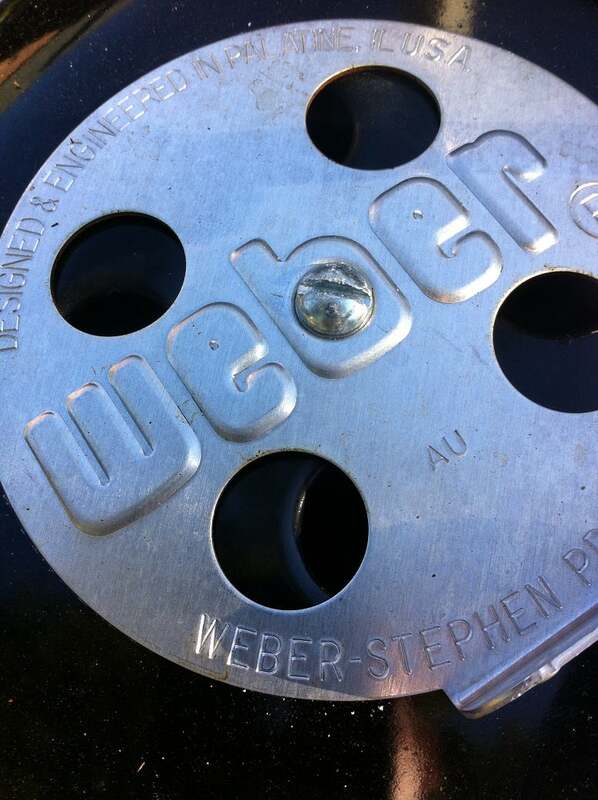 I think the air control on the bottom of the Weber Jumbo Joe is actually tighter than on my 18 inch One Touch Silver. If I was going to go for an 8-10 hour cook with the Jumbo I would switch over to lump charcoal. At the 6 hour point I could tell that ash buildup was starting to become an issue. There was enough ash that the coals were struggling to get air and there really wasn’t an easy way to remove the ashes from the bottom of the kettle. If you use a high quality lump charcoal then you ought to be able to burn for a heck of a long time before ash buildup becomes an issue. An important detail I realized about the Jumbo Joe is that the distance between the charcoal grate and the cooking grate is only 3.75 inches. This is the same distance as found with the Smokey Joe Gold and Silver grills. 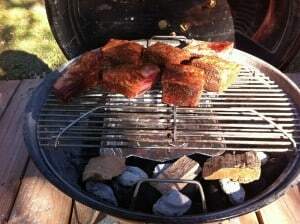 On the full size Weber kettles the distance between the two grates is a full 5 inches. This detail is important as it means the Smokenator 180 will not fit into the Jumbo Joe. The Smokenator products are designed to help Weber kettles become serious, more efficient smokers. I sent the Smokenator folks an e-mail asking about the dimensions of their product designed for 18 inch Weber kettles (the Smokenator 180). They replied that the 180 was 5 inches tall. That is, it will fit perfectly in the 18 inch One Touch Silver or One Touch Gold but it will not fit the Jumbo Joe. You are not going to have room on the Weber Jumbo Joe to go low and slow on a slab of spare ribs or a 13 lb packer brisket. If you are looking to smoke a brisket flat, a chuck roast, turkey breast, or other smaller cut then the Jumbo Joe is a great tool for the job!! An important note..I bought the 18 inch hinged grate ($16) for this experiment. The hinged grate does NOT come standard with the Jumbo Joe. The hinged grate makes adding fuel during a long cook very easy. Updated 11/18/12..Here is my full Weber Jumbo Joe Review. Enjoyed your review of the Jumbo Joe, am ordering one today. For indirect cooking/smoking on the 18.5 OTS, I made a a 6″ barrel out of roof flashing, by pop riveting together, Added handles and a bottom rack to hold a 16″ pizza pan to catch the juice/grease. Works fine but the one touch system is harder to adjust than kettles with the daisy wheels..Total cost is less than $20 excluding the thermometer. Unlike the old Jumbo Joe, the new one is the same diameter as the OTS, so it will work fine on the new model and will make a great single level smoker.. I love the idea about using the extension for the indirect cook! I assume the roof flashing isn’t galvanized? Would love to see the pics! Great reading! I don’t have a truck to take my 22.5 one touch to our smoking competitions at the pool. Even when I break it down it barely fits in my Saturn. 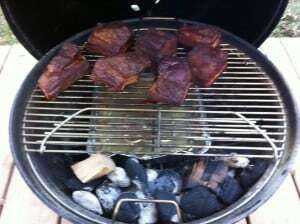 So I asked google “does a smokenator 180 work with a Weber jumbo Joe?”. Found your article. Thanks! Hello, I did a single rack of ribs on my Jumbo Joe that was cut in half and laid side by side. I used the Weber indirect grill grates (one) and put 22 Kingsford coals in and laid it on one side (ribs opposite side). 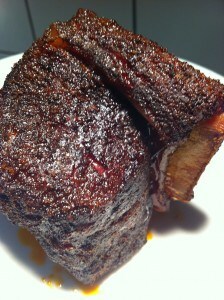 The turnout was about the same as 3 full racks (cut in half and in a rib rack). as my Weber one touch. About 3 hours. 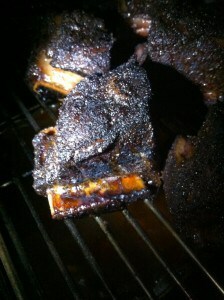 When the rib meat starts to pull away from the bone I give the bone a twist with a pliers. If it twists easily they’re done. I add 3 coals per hour. BTW, this was in Florida with average temps in the 90s. I love my Jumbo Joe but have not mastered the direct grilling yet. Funny as I have the indirect down! Steve, sounds like you are getting the Jumbo figured out! I found something similar…low and slow is much easier than hot and fast on the Jumbo. Delighted that you are enjoying the grill!